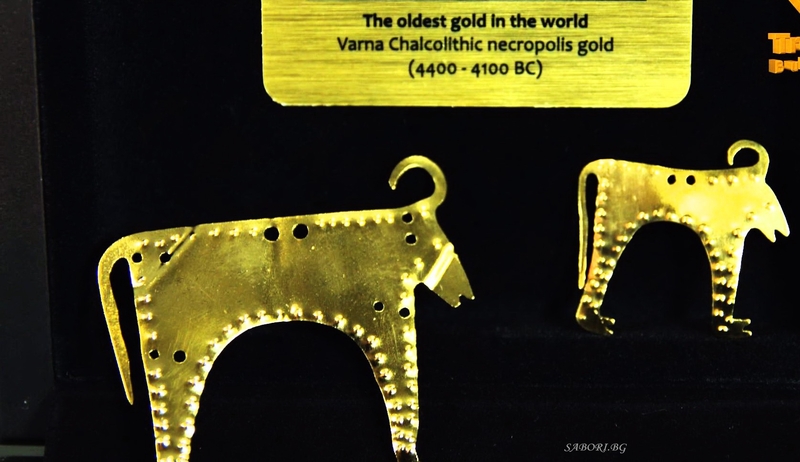 In 1972 a group of people working on the shores of Lake Varna noticed several strange gold objects in the earth dug out by their steam shovel. 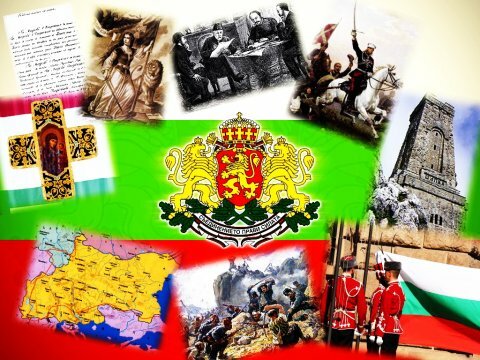 In those days the hysteria about the ancient roots of Bulgarian history, orchestrated by the Communist regime, still had not reached its peak and treasure hunting had not completely disappeared. The construction workers did not realise what they were looking at. Fortunately, they phoned the local musuem archaeologists. And there they had it - the oldest processed gold in the world, 7,000 years after it was crafted. 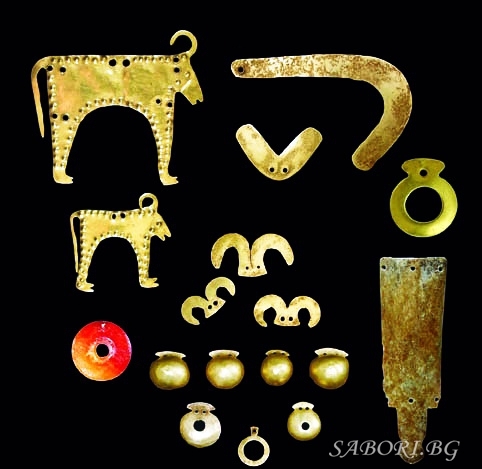 The first finds unearthed at Varna were a hitherto unseen sceptre with a gold-plated hilt and huge golden bracelets. Thorough excavations began immediately and each day brought even more extraordinary discoveries. The scientific community was stunned: the artefacts from the Chalcolithic necropolis (c. 5000 BC) were revealing, piece by piece, astonising information about the people who'd owned them. 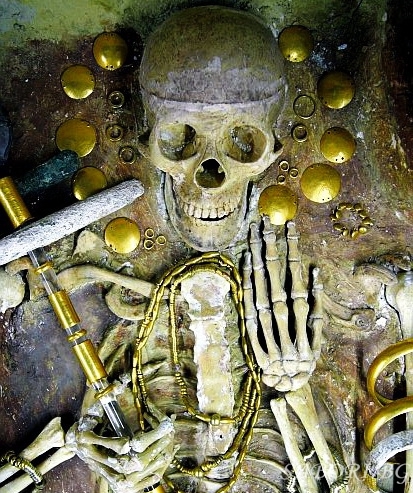 In fact, only a few of the 300 graves contained gold, but it was in impressive amounts. 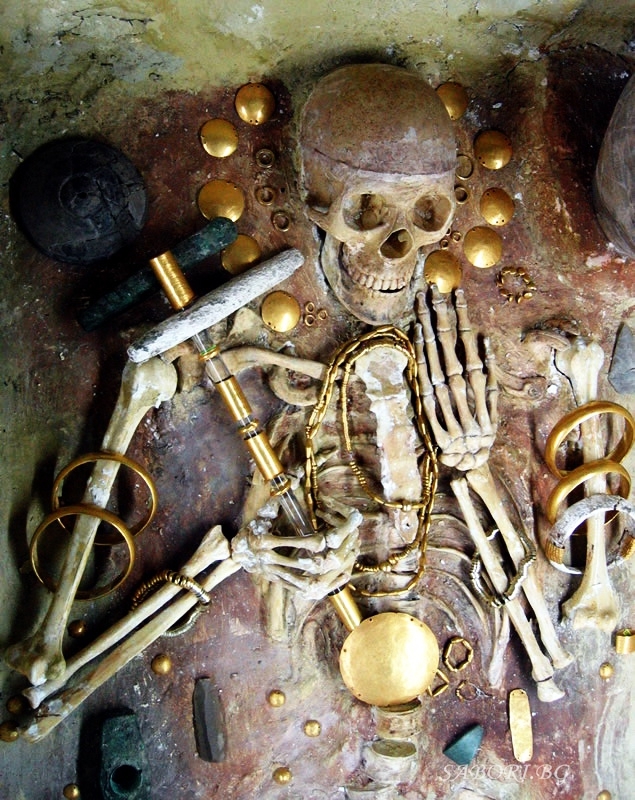 The skeletons' necks were sprinkled with hundreds of gold beads which were once necklaces and there were bracelets on their arms and tiaras on their heads. The graves were full of decorations which once adorned the clothes. There was also gold on the exterior of the earthenware pots left there as gifts. 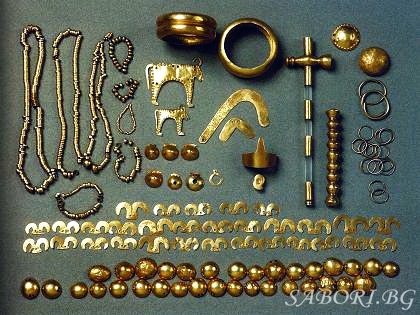 Archaeologists discovered that the people buried near Varna also valued bracelets made of the Mediterranean Spondilus shells, which could only have reached the shores of the Black Sea if imported intentionally. 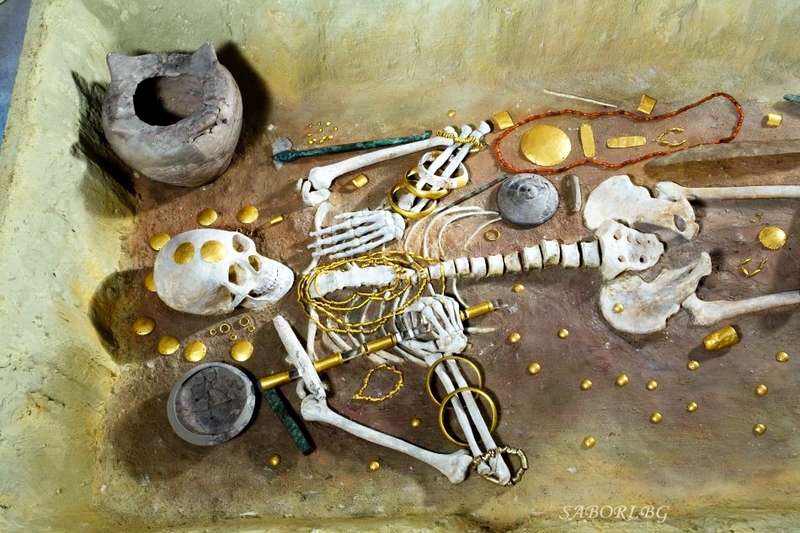 Some of the richest graves, however, were not the resting places of people but of primitive clay masks, on top of which there was gold jewellery and ornamentation. Were these cenotaphs the symbolic tombs of gods or did they belong to monarchs who had died far from their native land? 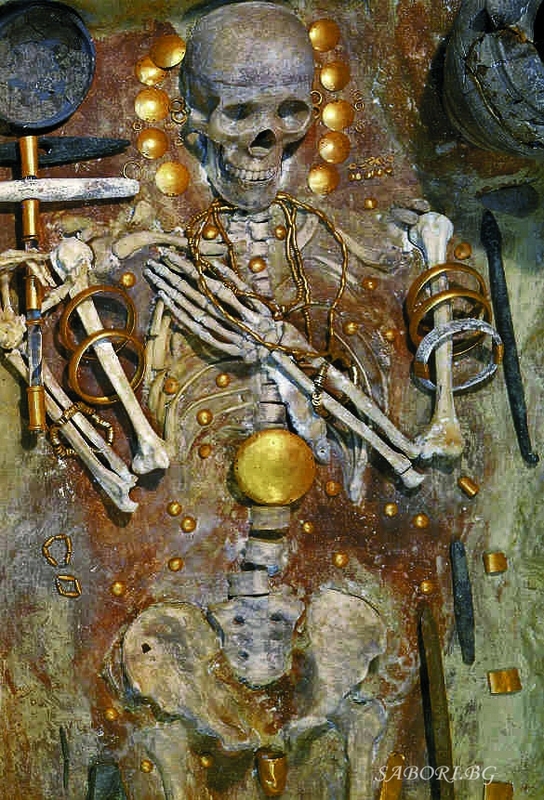 There is still no answer to this question but the finds from Varna show that the people who created the necropolis had a developed social and religious structure. On top of the social pyramid there was a king who had religious power too and a small group of trusted "aristocrats". 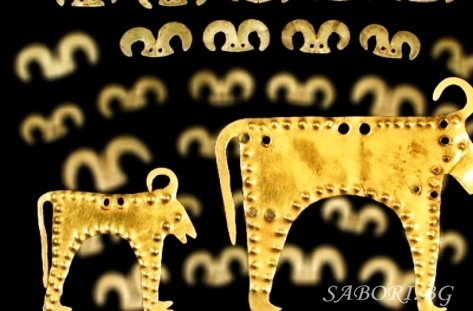 The common people were horsemen and stock-breeders, farmers, sailors and pottery and gold jewellery artisans. 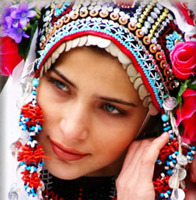 These people, who inhabited the area of the present-day Black Sea coast 7,000 years ago and were skilled metal-workers and builders of well-planned and fortified settlements, were one of the earliest European civilisations. 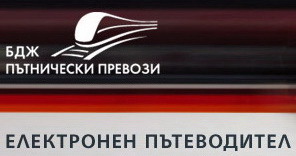 But what is their connection to the Thracians? Some theories claim that the Thracians, an Indo-European tribal group that was formed in 30th-20th Centuries BC, were the descendants of the mysterious people who inhabited the area around what is Varna today.